Question: Which method, using a piece of paper or lighting candles, will get the egg into the bottle in the least amount of time? Hypothesis: We predict that the method when you light a strip of paper and put the egg on top of the bottle will take less time than the method using candles because the oxygen will be used quicker. This will happen because the flame is bigger. Be careful with all of the materials, there will be fire. Egg with the strip of paper. Put paper in the bottle, flame down. Put the narrow side of the egg on top of the bottle and start the timer. Examine and observe the egg. Stop the timer when the egg is in the bottle. Egg with the birthday candles. Put 3 birthday candles in the narrow end of the egg. Flip the bottle over and place on top of the egg and burning candles being careful to not push the bottle down. The oxygen in the bottle gets used up by the flame and the air in the bottle then gets heated. The air pressure then increases and takes up more room in the bottle. After the air cools down again it contracts, creating a tight seal between the egg and the bottle. The air molecules then come back together. The outside air wants to get into the bottle to balance the air pressure. When the air tries to rush in, the egg gets pushed into the bottle. In conclusion, our hypothesis was correct. 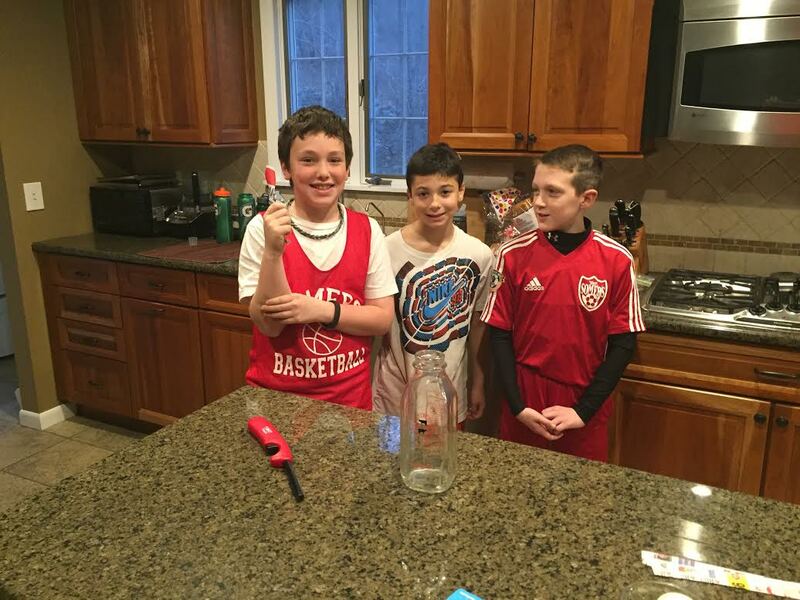 From this experiment, we learned that the bigger the flame, the faster the egg gets sucked into the bottle. The papers area was bigger so, the flame on the paper was bigger than the flame on the candles. Therefore, the oxygen in the bottle was used up faster by the burning paper than the burning candles and the egg was sucked into the bottle in less time. Jared is 11 years old and loves to play soccer. Jared also likes to play video games like Splatoon. He lives with his parents and younger sister, Alexandra. She is 7 years old. Jacob is 10 years old and enjoys playing soccer. He also enjoys video games, cards and playing with magic. He lives with his parents and younger brother, Noah who is 7 years old. Liam is 10 years old and enjoys playing the position striker in soccer. He also loves to play FIFA on Xbox. He lives with his parents and his twin brother, Jack, and older brother, Joey.